Whether you are a hobbyist or a professional, our selection of custom films and hydrographics equipment are the best in the industry. Looking for our custom services? Have a custom project? From hydrographics to custom painting, Liquid Concepts can help make your idea a reality. Hydrographic dipping is a versatile way to add images to many different materials, including glass, metal, plastic, ceramics, wood and fiberglass. 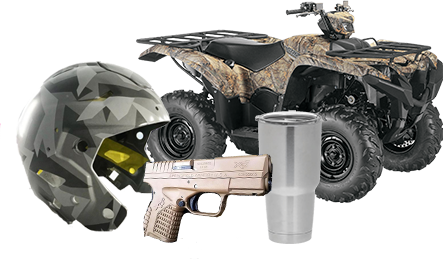 Hydro printing professionals as well as hobbyists use this printing method to add custom images to a wide variety of items, from Yeti cups to ATVs, bike helmets, car dashboards, firearms, and much more. If you can safely submerge an item in water, chances are that you can customize it with hydro dip film! Liquid Concepts offers a vast selection of hydrographic dipping products to help you get the best results, whether you own a water transfer printing business or you’re a hobbyist who wants to customize your gear the DIY way. We offer a widely varied collection of hydro dip films, so if there’s a particular image you’re looking for, chances are that we have it! We have camouflage, nature scenes, animal prints, carbon fibers, skulls, flags—just about anything you could imagine. We’ll work with you to make sure you have exactly the custom hydrographic dipping films you need. We can also apply hydrographic films for our customers that are interested. We can facilitate larger production jobs as well as one off customization jobs of any size. We also have many different paint colors that you can use as a base coat to make your water transfer printing images pop that much more. From solid colors to glitter, neon, glow paints, metallics and primer, we have all the paints you need for use with your hydrographic dipping projects. Of course you can’t do water transfer printing without a good tank, so we offer tanks in a variety of sizes—even DIY hydro dip kits for beginners who want to give immersion printing a try. Liquid Concepts is committed to offering excellent customer service and quality products that last. We don’t sell any hydrographic dipping equipment, films or supplies that we wouldn’t use ourselves! We welcome your questions about our products and the hydrographics process. For those who would like professional training, we also offer different courses in water transfer printing both online and in-house. 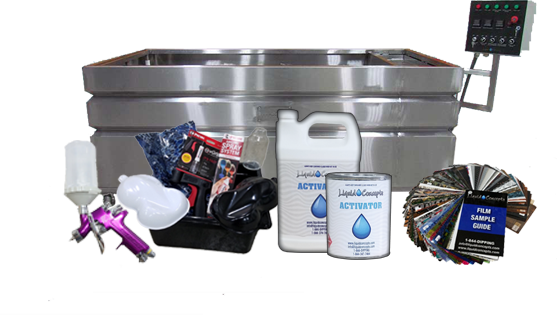 For the best in custom hydro dipping equipment and custom films of any image, shop with Liquid Concepts and order online today!